After attending the Bobby Charlton Soccer School aged 11, impressing coaches with his natural ability (and becoming skills champion for his age group), David’s future was effectively secured when he signed for Manchester United as a trainee in 1991. Following a short spell on loan at Preston North End, David fulfilled a dream when he made his Premier League debut with Manchester United in 1995 against Leeds. During the 1996/97 season, he famously scored from the halfway line (a feat not even the great Pele accomplished) against Wimbledon. By the turn of the millennium, David was a household name. Not only as a treble winner with United, but also as a world renowned free-kick specialist and an England regular. It was only a matter of time before he was granted the England captaincy, a major achievement and personal milestone for the player. His skills on the field earned him the title as one of the world’s premier soccer players and a hero to fans across the globe. 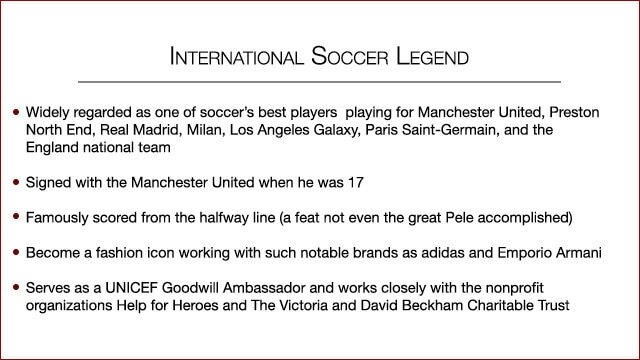 Off the pitch, Beckham has become a fashion icon working with such notable brands as adidas and Emporio Armani. Working with fragrance designer Coty, David and his wife Victoria have signature fragrances celebrated throughout their global fan base. Through hard work and determination David realized his dream to be a professional soccer player. It’s a journey that has taken him around the world to play on the greatest soccer stages for some of the biggest clubs. Since retiring in 2013, David dedicates his free time to a number of nonprofit organizations, as a UNICEF Goodwill Ambassador. He also works closely with Help for Heroes and his own charity the Victoria and David Beckham Charitable Trust. An Evening with David Beckham In a candid conversation, David Beckham gives the audience an inside look into his career as a world class soccer star, life in the media spotlight, the various causes he’s passionate about and what has inspired and motivated him to the top of his game.